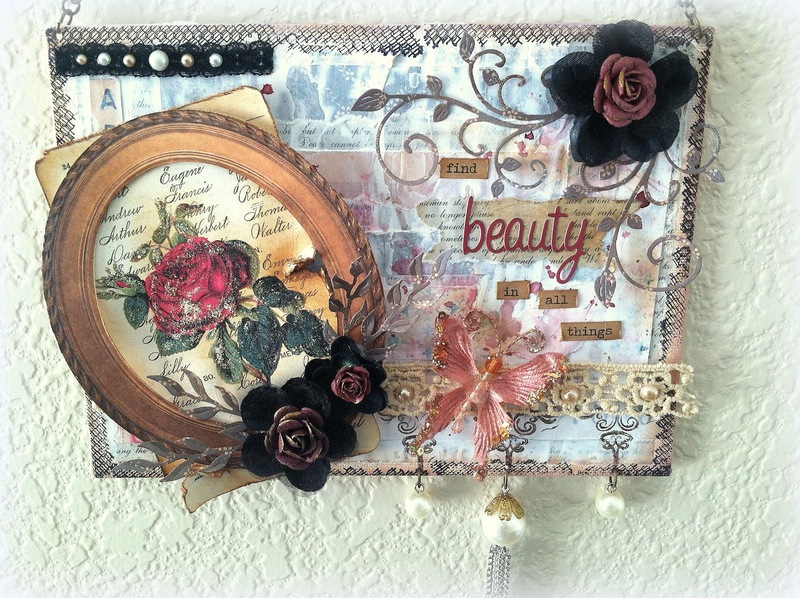 Scrapping Fancy: Welcome to Swirlydoos' August Kit Reveal Blog Hop Block Party!! Welcome to Swirlydoos' August Kit Reveal Blog Hop Block Party!! If you came here from the 7 Gypsies blog, then you are on the right track. If not, go back to Swirlydoos' blog and start from there. We have some amazing projects for you to see today !! The August kit, "Vintage Traditions", is so unique! I really enjoyed working with the papers in this kit- such an amazing variety, yet each perfectly complimenting the other. I love all things vintage, and try to add a vintage flair to most of my project, but this kit is really versatile, and you can create a number of styles from it. I thought I was going to just use some of my heritage photos for my layouts, but it turned out that everyday pics work just fine with this gorgeous collection! So, I just dived into this kit by ripping up paper! I had just came back from taking a class from Anna Dabrowska, and my kit was waiting for me when I got home. In the class, we were ripping up pieces paper and making masterpieces with them- it was fresh in my head, and I just had to try it for myself, unsupervised! I decided to make a canvas, and this is the result. I started with a thin canvas I purchased from Michaels- I love how thin they are! So, I put all of the ripped "scraps" in random places on the canvas for a background, then applied gesso over it using an old credit card. You can still see the pieces, but they are faded. Next, I used Red Velvet Glimmer Mist in random spots after the gesso dried. I inked the edges, then used a "net" stamp on them. The piece of paper with the rose on it is a card from the main kit. I touched the rose with Diamond Stickles, then sprinkled some Diamond Dust over that. I used alphas and Tim Holtz "Chitchat" words from my stash to add one of my favorite quotes: "Find Beauty in All Things". The swirls and iris leaves are made with Cheery Lynn dies. 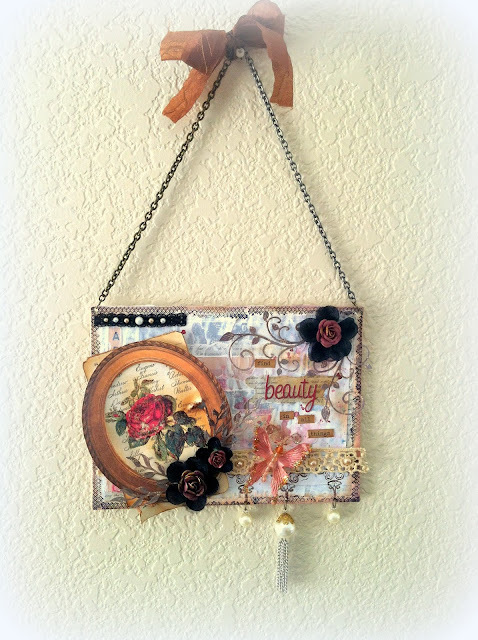 I finished up the project by adding some Tim Holtz Baubles and 7 Gypsies chain to hang it up. I was still on my Anna "high" when I made this layout, which explains the "grungy-ness" which I LOVE. It also follows the sketch that comes with the kit. I started with the the background newspaper sheet (Bazzill)- it's actually gray, but I used Antique Linen Distress ink to give it a yellow hue. I cut out the middle so I could use it for other pieces on the layout. I used the Distrezz-it-All on the second layer, and did some faux stitching as the outline. I also used the distress ink to get the worn look around the edges. The circles are "coffee stains" that I made with Vintage Photo Distress Ink and water and a coffee cup. Inside each of the circles, I used the circle stamp that came in the embellishment kit with Walnut Stain Distress Ink. I used my Cricut (GASP!!!!) to cut the heart out of the red cardstock from the cardstock add-on. The flower cluster corner has black flowers that came with the kit, but I added my own Prima cream roses. The fern leaves were cut with Cherry Lynn dies. The paper is the Bazzill script print that I inked green and used a polka-dot stamp on. I finished up the cluster with canvas fibers that I curled between my fingernails. The alphas are all from my stash. The buttons and arrow came in the embellishment add-on in the Maya Road Junk Box. I took this pic of my daughter a couple of months ago, and have been waiting for the perfect papers to scrap it- these 7 Gypsies ones are it! I cut the gray paper with a wavy motion, and distressed and inked the edges. I cut a 10 inch circle out of the pink script paper, (again, using my Cricut! I think I should get a prize for busting that thing out!) Then inked and distressed it. I also did faux stitching on the edges. 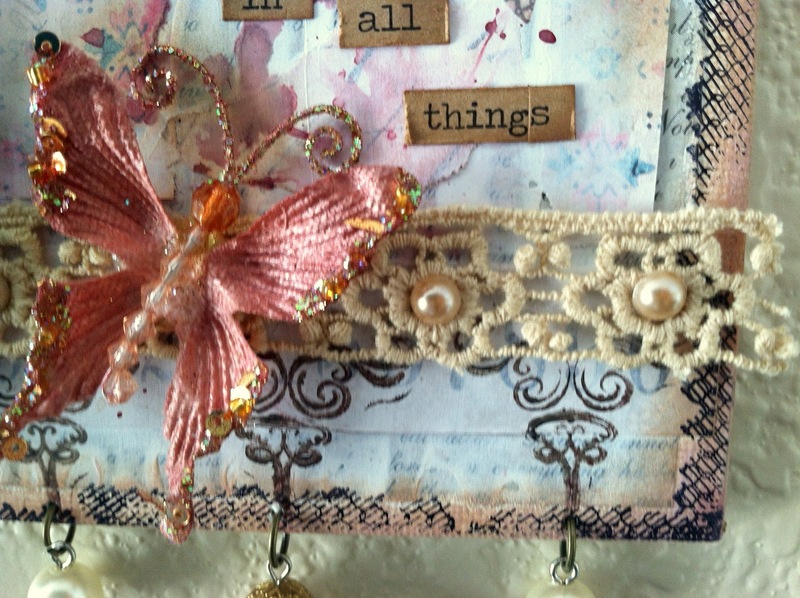 I used some beautiful old Prima lace from my stash because it went so well with the papers! I placed tiny beige pearls on each "pleat". 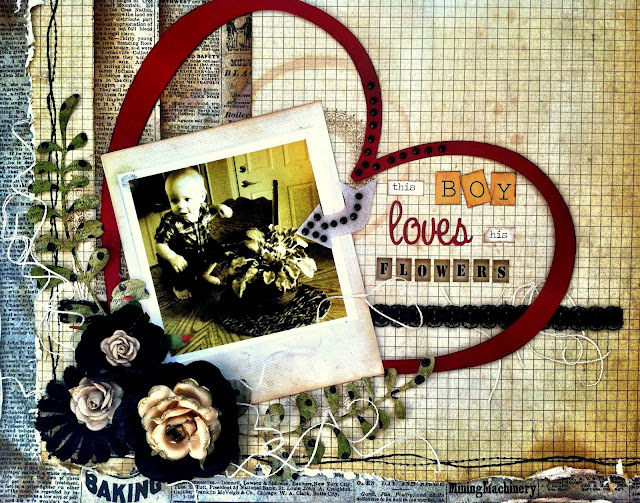 Then, I used the Prima brick mask with Vintage Photo Distress Ink and blending tool. In the flower clusters you will notice a couple of little blue roses- I added those because my daughter is wearing a blue bow in her hair, and it just "fit". The dies in the flowers are from Memory Box, as well as the leaves in the right-hand corner with the two Maya Road heart trinkets. In this close-up you can see the title better I inked the letters with pink ink and used a polka dot stamp to black dots on them, but they didn't show up well at all on the layout, so I used gold embossing power on them. The "O" is the metal Prima frame that comes in the main kit, and the bird is from the flower add-on. This is a birthday card for one of my friends, hence the saying, "A Magical Day". I started with a couple of 5X7 pieces of pink paper (Kaisercraft, and 7 Gypsies), and distressed and inked the edges, then layered them. I curled up the edges for added dimension. The lace is inked to give it a worn look. 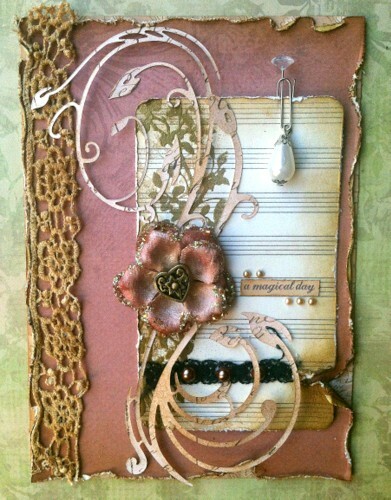 The lined paper is the back side of a journal card from the main kit, distressed, and embossed with gold embossing powder and a stamp from the embellishment add on. The flourish is from a Cherry Lynn die - I also painted it with Smooch Glitz in pink for extra sparkle. I added a heart trinket from the Maya Road junk box set to the center of the flower, added the title and pearls, then one last small feature- the TH paper clip with a bauble. So that's it for now. I hope you enjoyed looking at my projects and found some ideas you can use on your own! Thanks for having a peek! Once you have visited all the blogs and collected all the special words, they will create a sentemce. The party continues over at the amazing Lisa Gregory's blog. Have fun! Love your canvas!! Your pages are really full of richness this month. Great job!! Each of your items is more beautiful than the next! Love the canvas, the layouts and that card is to die for! Looks like the class you took was full of great inspiration! TFS! Stunning projects Rae. Love all the techniques that you used. Gorgeous all of it!!!! I am especially in love with your canvas; that is totally stunning!!!!!! Great wall hanging, gorgeous work on all for this month. Stunning projects, Rae! LOVE that canvas! Soooooo gorgeous! So many beautiful projects - that doll layout is so captivating! I absolutely love your canvas. I just started making them and yours is an inspiration for me. You guys all rock, such lovely lovely things to look at on each blog........thanks for the opportunity to win a fabulous prize. Gorgeous canvas.....fabulous layouts and gorgeous card. Love the canvas. You created unique projects! Oh Rae, I love every single project you did with this gorgeous kit. I soooooo love that beauty of a canvas, and your pages..... adorable. I also love the beautiful card. Amazing work, all over. The canvas is so unique and gorgeous! Thank you for telling us how you did it. I love the layouts. Each one has it's own style...beautiful projects! WOW ... these are some seriously creative projects. You can tell they were created with lots of love! So much attention to detail! Your work is so full of pretty details - just totally beautiful! Beautiful work! Great blog hop. 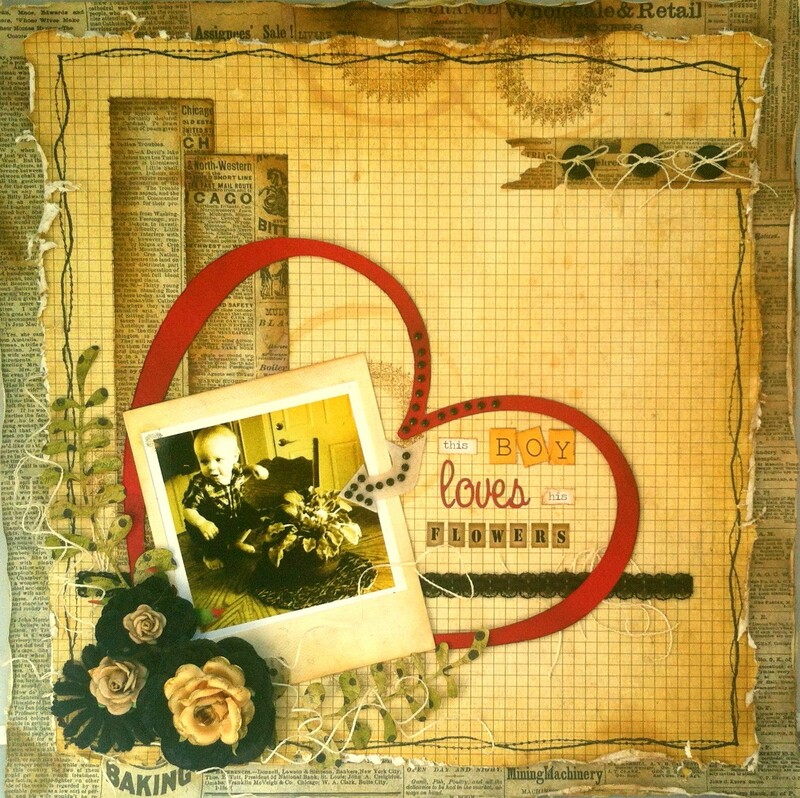 Fabulous canvas, two amazing layouts and that wonderful card - what an outstanding post! Gorgeous use of the kit, and clear that you've brought a whole new set of skills home from the Ana workshop! I love this blog hop,all of you are soooooo talented. Holy cow.....stunning layouts! I love the layout using the monthly sketch,it is so romantic, yet all boy at the same time. Love it. O.M.G! Stunning projects! I especially love that gorgeous canvas! Lovely, lovely work. Thanks for sharing. Rae your work is gorgeous. Rae...you've done a fabulous job with this kit! You aptly titled your Little Doll lo perfectly cause your daughter is a doll! Love the canvas, layouts and cards - great use of all the techniques you learned. Thanks for sharing! Beautiful work Rae, I love how you did the "O" with the frame and bird, so pretty! Your worka are always sooo gorgeous. I love all the details. Beautiful! Beautiful projects! Love the canvas espesially. 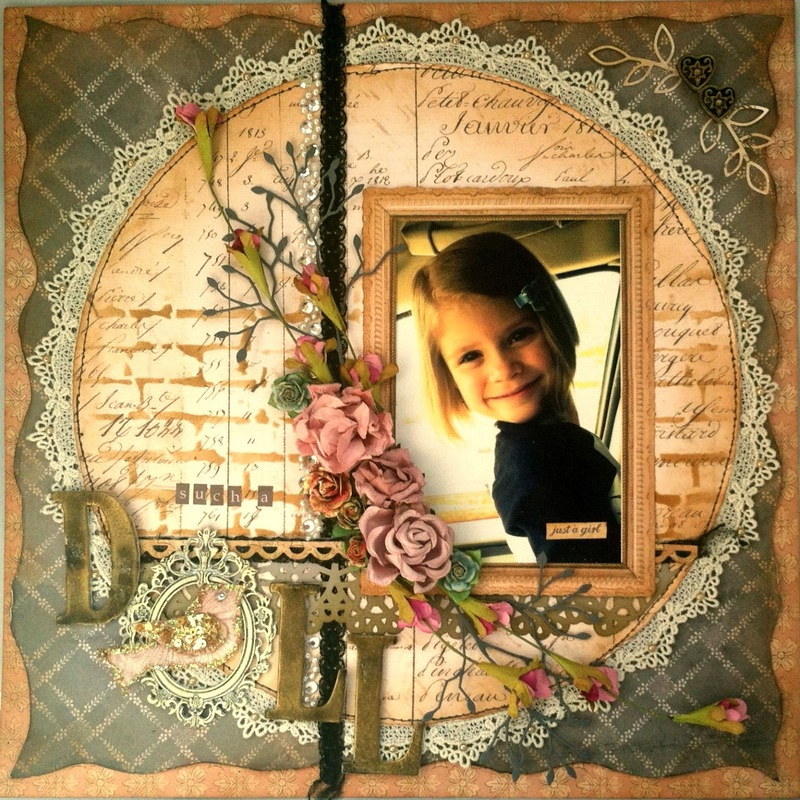 The layouts are beautiful and love how you added the large frame to the canvas. GORGEOUS!! Love the canvas and your layouts! Exceptional! Gorgeous canvas, what a stunning piece honey! So beautiful! Love the layouts as well, the card is amazing! Love your canvas-my fav is the vintage rose with frame!!!!! Oh so pretty! love the layers and textures. Love your canvas art Rae!!! 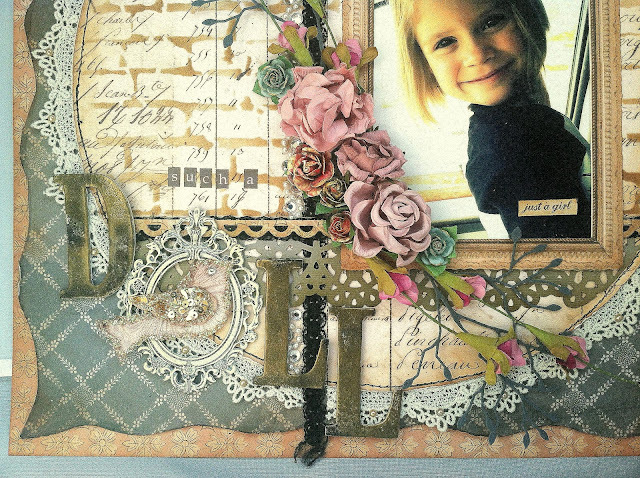 This kit was perfect for our off the page projects!! Your layouts and card are just as lovely. Beautiful work!! Beautiful projects!!! I love you canvas!!! Rae, gf! You did amazing wonders with this kit! Love the layout of your dd. That photo is enchanting and you'e done a beautiful job! Hope you have a great weekend! I really enjoyed how you used all the elements. Good job! How cute is this ! Thanks for the inspiration! All of it is OH SO GOrgeous!!! Your wall hanging is my fav!!!! Beautiful done, girly!!! love your work....great butterfly on the canvas. Love this kit. So great! Gorgeous work Rae!!! Love it all! WOW, WOW, Wow what beautiful work and I am jeolous that I didn't go to that class. TY for sharing how you did your projects. They are just amazing.